Please note: We don’t allow Drop-ins in our Series classes, but we do offer a few Aerial Drop-in Classes on the weekends! You can get more information on our Drop-ins here. Night Flight offers adult (ages 16 and up) Series classes in aerial & circus arts in Portland, OR. Our Series classes are the perfect learning environment for students of all levels, from beginner to advanced. Aerial Series technique classes include silks (tissu), static trapeze, lyra (hoop), rope and straps. New students interested in our Aerial Series classes who have no previous aerial training are required to start with either Absolute Beginning Aerial or Beginning Aerial 1. Night Flight also offers Series technique classes in stretching, contortion and handstands (hand balancing). Each Series class covers a specific set curriculum. Class size is limited, so register early. Our 4-week Absolute Beginning Aerial Series is designed for complete beginners and moves a little slower than our 7-week Beginning Aerial 1 Series. It is designed for people who are newer to movement classes and who might feel intimidated by joining an aerial class. If you are already active and experienced with movement classes, we recommend our 7-week beginning Aerial 1 Series. In our 4-week Absolute Beginning Aerial Series less time is spent learning beginner silks and trapeze poses and tricks than in our 7-week Beginning Aerial 1 Series. Emphasis is instead placed on floor conditioning and foundational exercises on aerial equipment. This Series is a great place to get in shape in preparation for Beginning Aerial 1 if it is needed. Also, unlike other studios, our both our Absolute Beginning Aerial Series and our Beginning Aerial Series have classes that are 1.5 hours long! We believe that letting students take their time to learn and not rushing through technique explanations is the key to students progressing. So each class incorporates a proper warm up, conditioning, pre-hab exercises, and the fundamentals of silks & trapeze. Just pick a class that’s right for your level and a day/time that works for you (that you can stick with it for the entire length of the Series) and visit our Online Registration. It’s just like signing up for a college class. Payment reserves your spot in our Series classes, so you will need to pay in full to know your spot is secure. Attending Series classes twice a week will make a HUGE difference in progress. We highly recommend this option. Our studio will be closed on Thursday, July 4th. No refunds/credits issued from the first day of the Series on. Refund/credit available, minus $35, for withdrawals up until the day before the first class of the Series. Series classes are not transferable to other students. Please email us at nightflightaerial@yahoo.com to if you need to cancel before the first day of the Series. There is no option to cancel an entire Series and get a refund through Mindbody. Students can now sign-up online to do their make-ups in our Friday, Saturday, and Sunday Drop-in classes or Open Gyms! Please note: Open Gym is for advanced students who pass our physical assessment and have instructor approval. Students must attend the appropriate level Drop-in class. If you have never done aerial before or are new to it, please attend the Beginning Aerial 1-2 Drop-in. Make-ups are not allowed in other Series classes. Make-ups can only happen during the length of the Series and after the Series ends make-ups expire. Find the date of the Series class you will be missing, click on the “Cancel” option on the right side of the table. You have now cancelled yourself out of the Series class. Click on the “Drop-in Classes” tab. Click on the Drop-in class/Open Gym you want to do your make-up in. Click on the “Make a single reservation button.” You’ve now signed yourself for the Drop-in class/Open Gym. Please Note: your coach will have marked you absent in the Mindbody attendance roster on the day you missed your Series class. In Mindbody, click on the “Drop-in Classes” tab. Please Note: Cancellations for Drop-in classes/Open Gyms must be made 18 hours in advance in order to get a Series make-up returned to your account. Click on the “Cancel” option on the right side of the table. You have now cancelled yourself out of the Drop-in class/Open Gym and the Series make-up has been returned to your account. While drop-ins are a great way to try aerial to see if it is a good fit for you, we strongly believe Series classes are the best way to learn. The biggest benefit of Series classes is that they taught in a progressive learning style with the same group of students. The group learns new material over the course of entire Series and skills build on top of each other. Since Drop-in classes allow new students to participate all the time, teachers need to cover basic foundational aerial techniques again and again. Which keeps the Drop-in classes from progressing in the same way as the Series classes. Having Series tightly structured and keeping students in their appropriate groups allows for challenging and fun classes. Perfect for students new to aerial. Learn fundamental aerial skills and basic movements on the silks and trapeze including climbs, inversions and poses. Focus is on building shoulder stability, core strength, upper body strength and overall flexibility. Training on the equipment follows a smooth progression. Continues from where our Beginning Series leaves off. In Beginning Aerial 2 students continue their survey style training on both the silks and trapeze. Focus is primarily on building strength, flexibility and stamina. Focuses on building techniques and skills on the trapeze. Students will build a vocabulary of trapeze tricks as well finding fluidity of movements on the trapeze. It’s designed for students who have already completed our Beginning Aerial 2 Series or who have had some previous aerial foundational training. Our 7-week Trapeze 1-2 Series focuses on building techniques and skills on the trapeze. Students will build a vocabulary of trapeze tricks as well finding fluidity of movements on the trapeze. This Series is designed for students who have already completed our Beginning Aerial Series or who have had some previous aerial foundational training. Our intermediate trapeze Series includes challenging aerial conditioning with a strong emphasis on form and technique as well as learning more advanced movements. Our intermediate to advance mixed level trapeze Series includes challenging aerial conditioning with a strong emphasis on form and technique as well as learning more advanced movements. Our advanced trapeze Series includes challenging aerial conditioning with a strong emphasis on form and technique as well as learning more advanced movements. 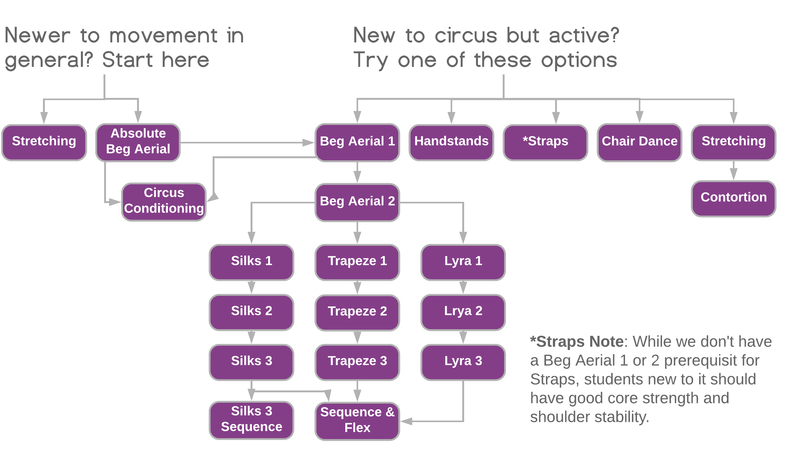 Students will learn beginning to intermediate movements on the lyra. Foundational aerial training is required. Students will learn intermediate movements on the lyra. Focus is on movement quality, flexibility and strength. Our 7-week Lyra 3 Series is for advanced Lyra students. This Series focuses on dynamics tricks and movements. Students should be able to sequence on the lyra with ease. Our 7-week Duo Lyra Series focuses on duo lyra skills and techniques. Student should be prepared to work as partners on the lyra. Mirroring as well as flyer/base skills will be covered in class as well as how work and communicate with an aerial partner. This Series is designed for Lyra 2 and 3 students and requires a level 2 permission. Silks 1 continues building on techniques and skills taught on the silks in our beginning aerial 2 series. Our Silks 1 series focuses increasing stamina, and movement quality while building a vocabulary of basic moves. This class picks up right where Beginning Aerial 2 leaves off. It’s designed for students who are ready to spend more time playing in the air. Learn intermediate tricks, movements and drops with a strong focus on beginning sequencing as well as movement quality and expression. This class is for individuals who have a solid foundation in aerial silks skills and want to begin putting it all together. For advanced students. Learn advanced tricks and movements. This Series focuses on building strength and stamina as incorporates routines. Our 7-week Rope Series. Learn intermediate to advanced movements, beats, tricks and drops on the rope. This class is tailored for students who are at a Silks 2-3 level. Prerequisite: Previous Silks 2 experience. Students will learn beginning and intermediate movements on aerial straps as well as conditioning for straps. Improve your flexibility! This classes focuses on deeper stretching and active flexibility. It is designed to be suitable for all levels. Our 7-week Handstands 1 Series focuses on proper form and technique for handstands and is also good cross training for aerial. This Series is for students who are newer to handstands and includes handstand conditioning. Our 7-week Handstands 2 Series focuses on proper form and technique and more advanced conditioning for handstands. This Series is for students who feel comfortable in a belly to the wall handstand for at least 30 seconds, are able to kick up to a handstand in the middle of the room without a mat, and are able to be spotted in the middle of the room. It will include longer holds and balances. Students will explore different shapes in handstand, work on different spotting techniques, as well as continue to work strength and flexibility for handstand success. Come have fun, get stronger, and feel more confident in the air with this conditioning class. Focus will be on strength building rather than new tricks. Includes conditioning in the air on a variety of equipment and on the floor. Students must have taken Beginning Aerial 1, and be able to climb the silks. Our 7-week Sequencing & Flexibility Series. This Series is 2 hours. 1st hr: short warm up and then assisted aerial sequencing on apparatus of choice. 2nd hr: flexibility training and deeper stretching. This class is strictly for advanced students. This is not a new tricks class, but rather a place to create routines with teacher assistance. Students must know a large vocabulary of movements to participate in this Series. Our 7-week Contortion Series is an advanced flexibility class that focuses on ‘tricks’ in splits/backbends. Includes arm balances such as forearm stands and handstands. Students in our 7-week Chair Dance and Dance Technique Series will learn an original group chair dance choreographed by the instructor and will also work on basic dance technique. This is a fun class and geared toward students newer to dance.